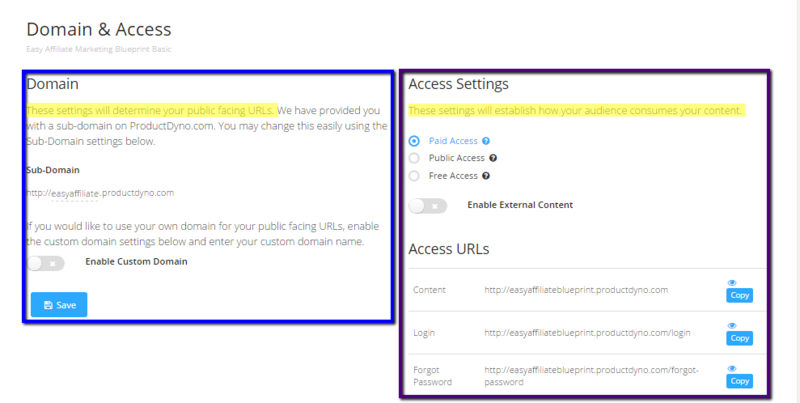 These settings will determine your public facing URLs. REMEMBER: If you are going to add your Product into a Collection, you don't need to worry about the look of the URL here (no-one will see it) - you will do it in the Collection. So the subdomain generated automatically for you will be fine! We strongly recommend that you use the Sub-Domain feature. This is the simplest setup. Just select a meaningful subdomain name to precede the productdyno.com domain name (as is done for many other SaaS such as ClickFunnels, Leadpages, etc). When you SAVE you will see that, on the right, the Access URLs will reflect your subdomain. Only choose to enable a custom domain if you are a "techie" and familiar with setting up DNS, CNAME records and so forth. Further information can be found in this article: Custom Domain Setup Please note that using Custom Domain has no SEO benefit since you are merely redirecting your domain name to ProductDyno. If your product materials are already situated on a server, you can instruct ProductDyno to access them where they are.